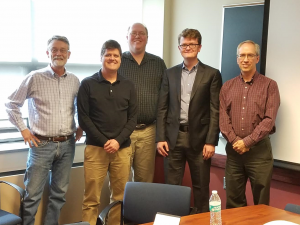 Congratulations to Geoffrey M. Lorenz for successfully defending his Ph.D. dissertation in Political Science at the University of Michigan. I have worked with Geoff since his first year at Michigan and it has been a pleasure every step of the way. Next he will be moving on to a postdoctoral fellowship at the University of Virginia. The committee (left to right): Richard Hall, Ken Kollman, myself, and Chuck Shipan. Participants in protests are significantly more supportive of political violence in the United States than are randomly selected citizens (i.e., ANES respondents). Question: How much do you feel it is justified for people to use violence to pursue their political goals in this country? Note: National Protest Surveys 2016-17 conducted at the Democratic National Convention, the Republican National Convention, the Counter-Inaugural Protests, the Women’s March on Washington, and the March for Life. Sample Size: ANES 2016 All Respondents (N=4,216); ANES 2016 Protesters Only (N=117); National Protest Surveys 2016-17 (N=2,081).